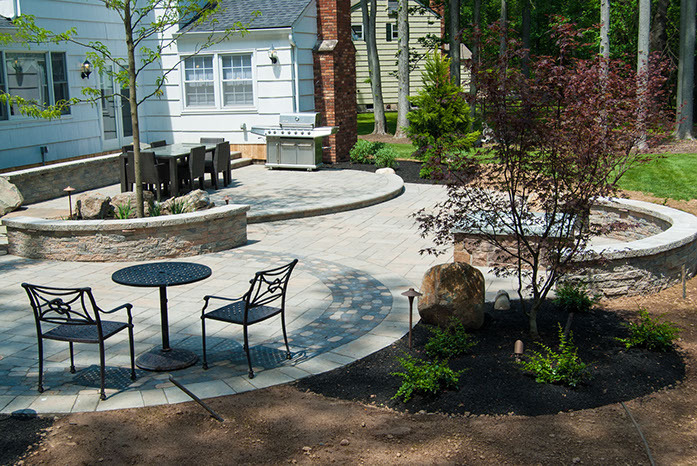 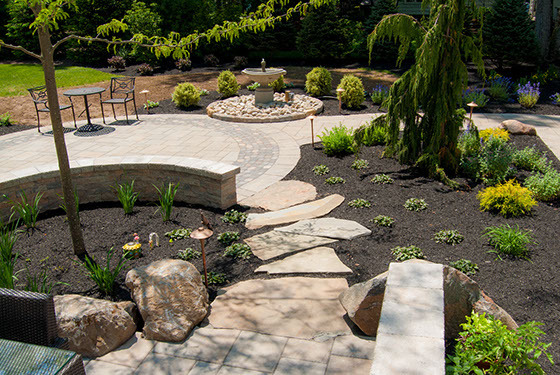 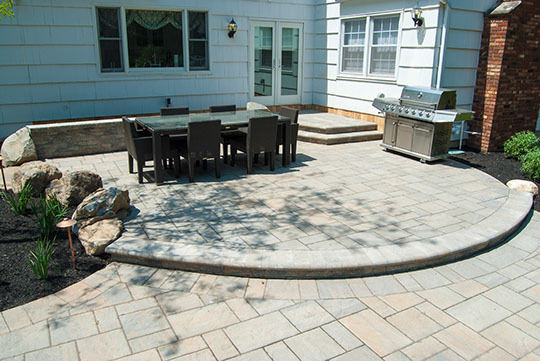 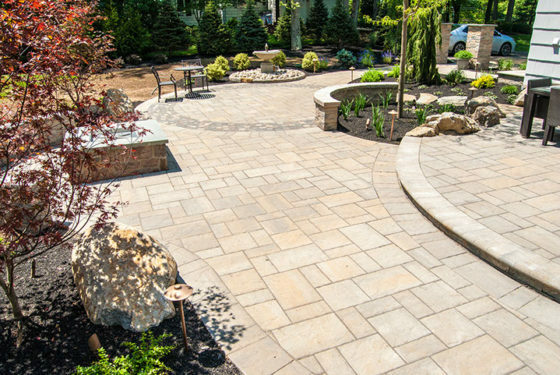 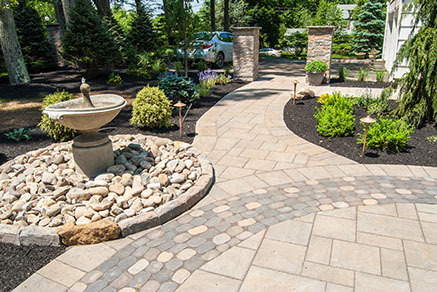 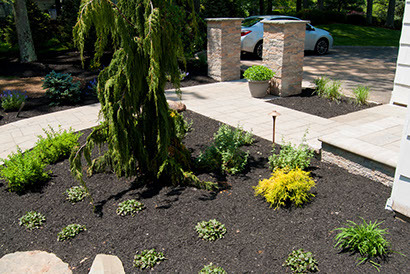 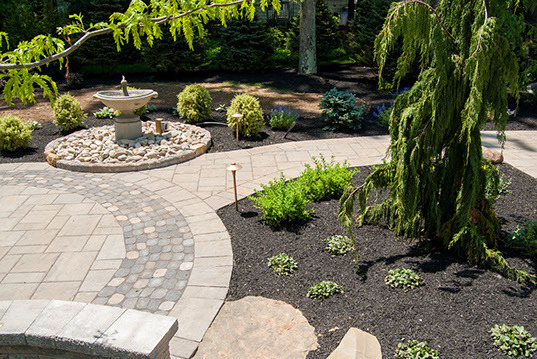 This Scotch Plains, NJ multi-radius patio was created with both form and function in mind. 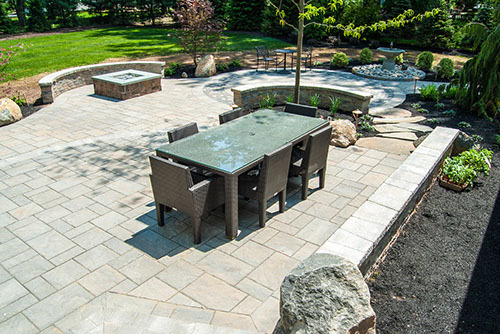 It easily adapts to any social entertaining situation. 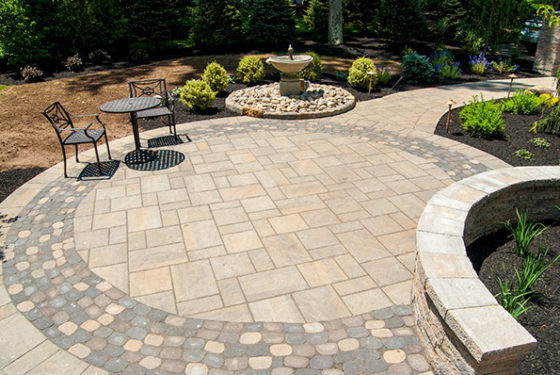 One circular patio spills into another, and then another. 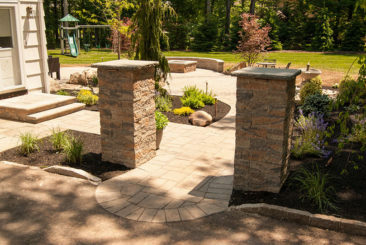 Woven into the hardscape design is a fire feature, a water feature, and natural plantings with boulders to form an earthy element. 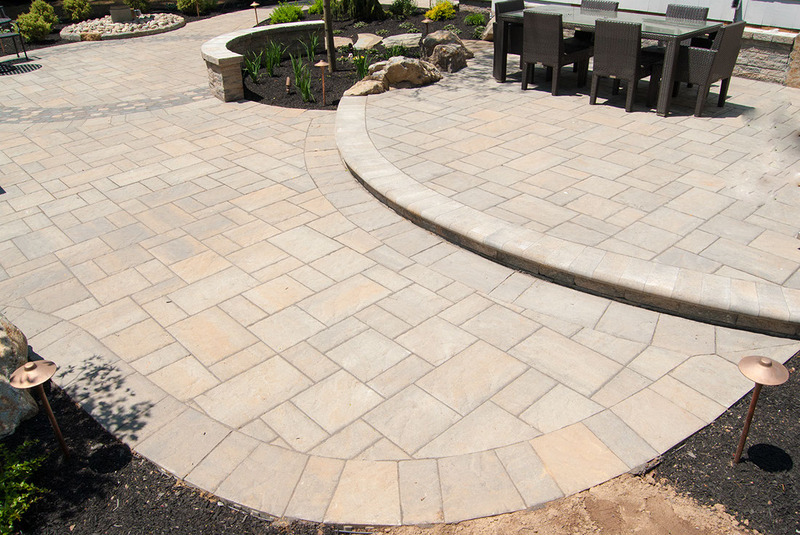 This design has it all with a lot of details that set it far apart from an ordinary patio. 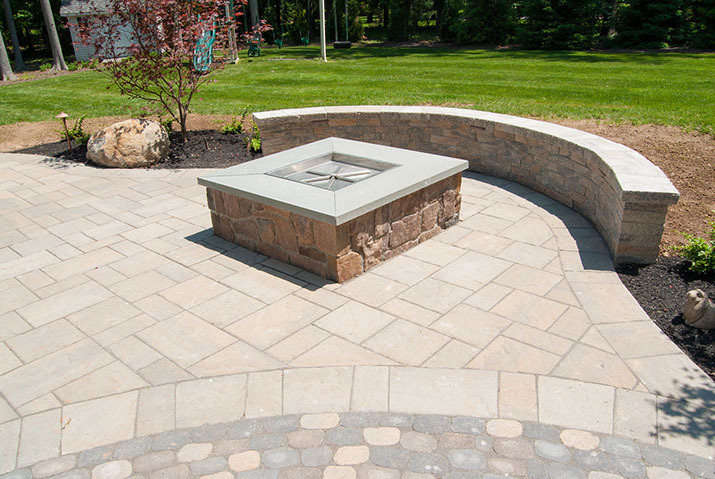 This fire pit is built in a hard edged square design which geometrically opposes the circular patterns of the patio. There is a sitting wall to gather around the fire pit on, and plenty of room for chairs to add on the other side. 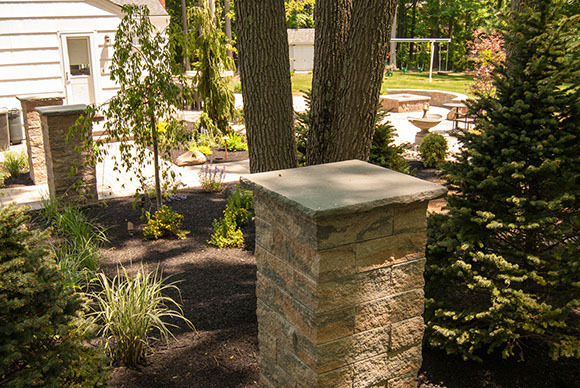 The stone veneers of the fire place are of a natural random form to add another layer of texture to the design. The sitting wall has cast lighting under the caps to illuminate the space at night. This is the garden water fountain. 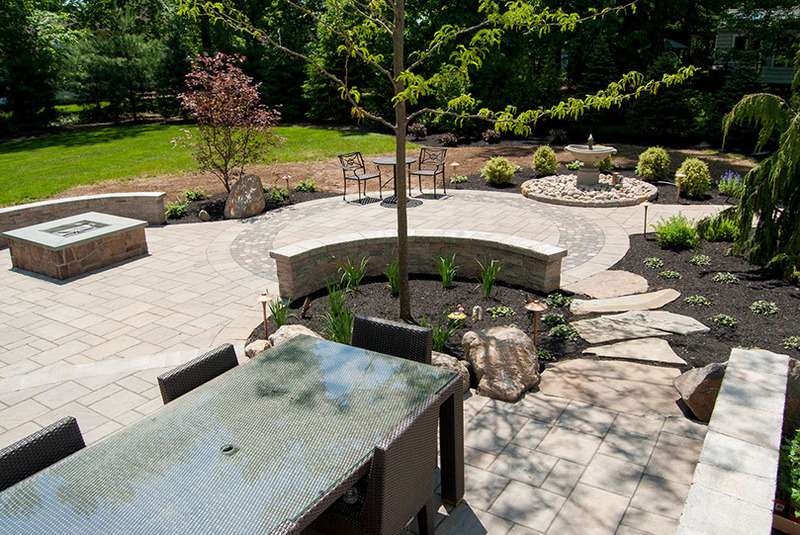 There is nothing like having a nice water feature in the middle of the patio. 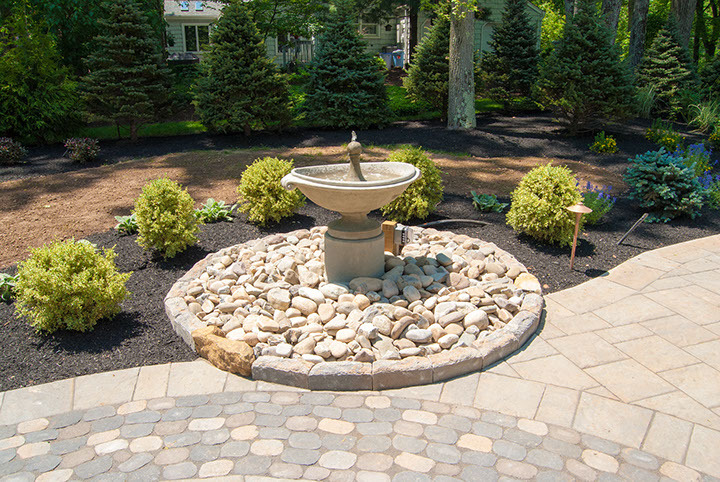 There is water flowing from this fountain which creates a nice natural sound of running water to help relax and calm you as you enjoy your patio. Birds might stop by for a drink too. River-jack stones sit at the base of the fountain which are edged with Belgium-block curb stone. 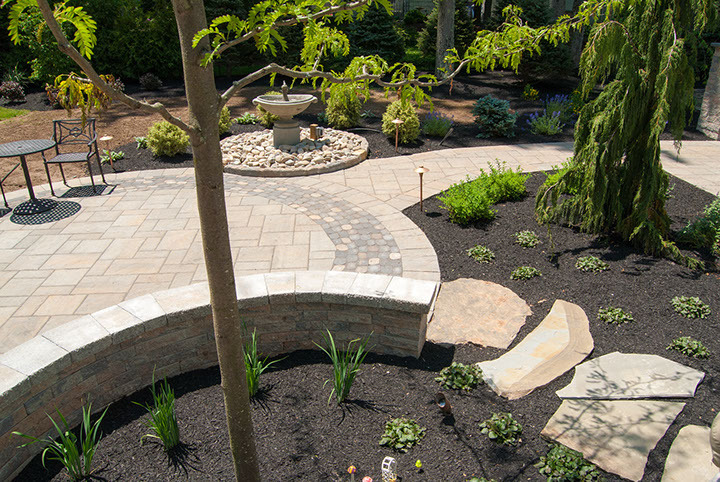 The fountain is surrounded by plantings. This patio design is a series of circles, one spilling into another to create a very unique custom looking patio. 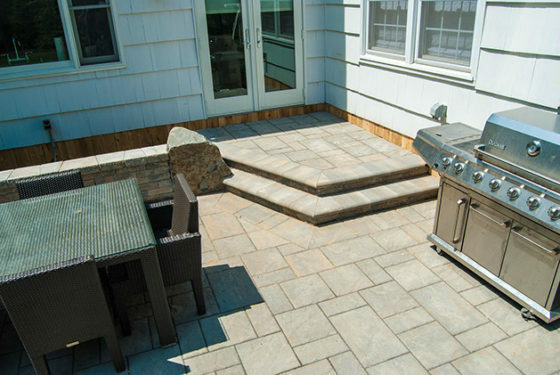 There is one tier which is rounded which holds the table and grill. 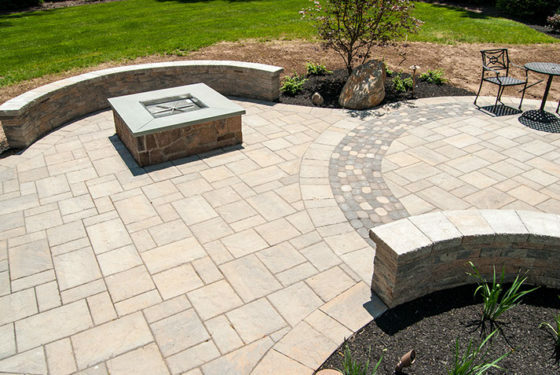 The main circle on the patio has an extra border of stones to make it stand out from the other shapes of the patio. 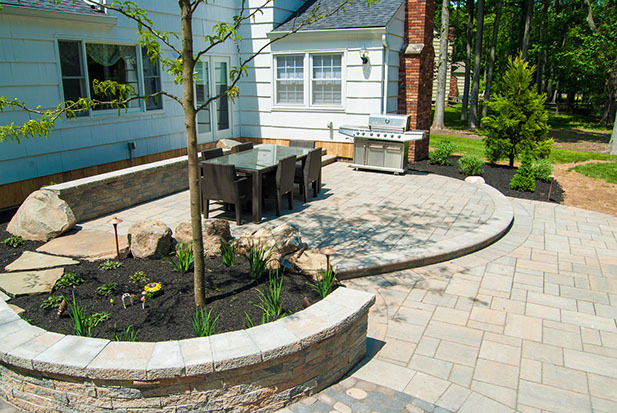 There are three sitting walls to add lots of additional seating for parties in this backyard. 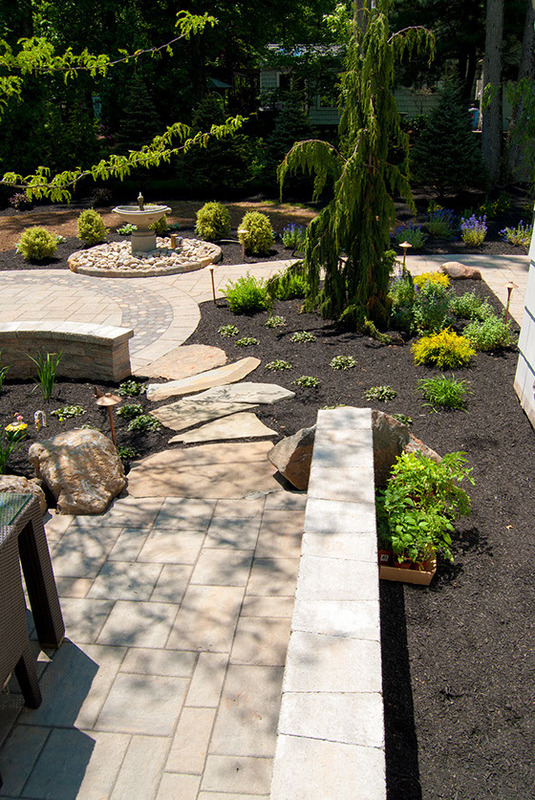 Two are circular shaped and one is straight along the house which the owner plans to grow a vegetable garden behind. 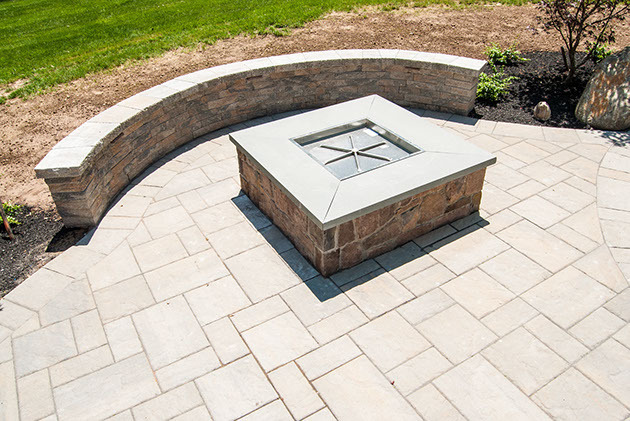 All the walls feature Cast Lighting for illumination creating a nice ambiance at night. 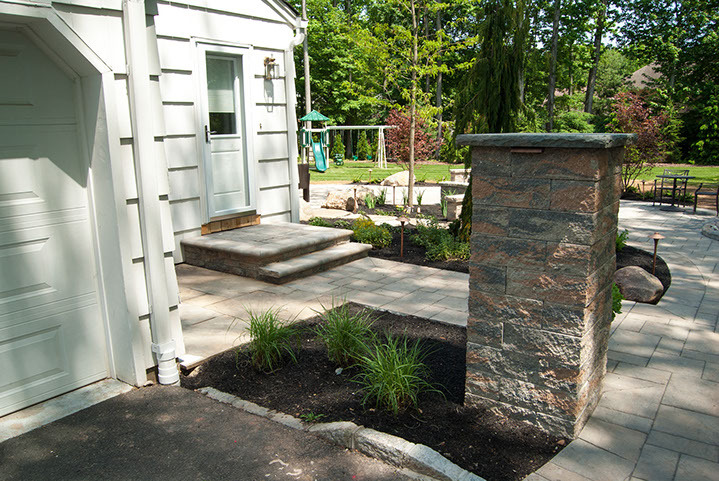 These stone piers welcome you into the patio space. 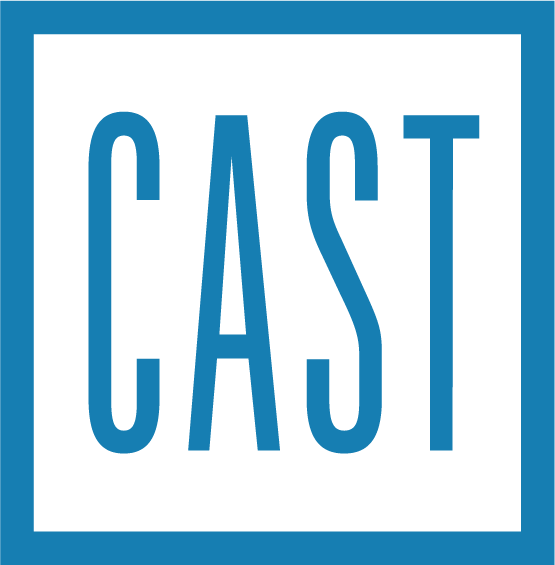 They feature Cast lighting. These nice porch steps match the patio paver bricks to blend in seamlessly with the overall patio look. The natural irregular shaped stepping stones accent the patio design and lead one from the back porch out to the driveway through the natural plantings.